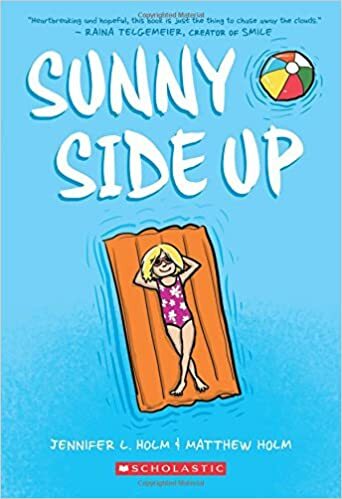 This graphic novel follows the summer of Sunny Lewin in 1976 when she is shipped off to Florida to spend her summer vacation with her Grandfather who lives in a 55 and older retirement community. Sunny thought Florida would be fun, after all that is where Disney World is! But, when she gets there all her Grandpa wants to do is go the post office, eat dinner at 4:30 in the afternoon, and entertain his old lady friends. Luckily, Sunny isn’t the only kid around. She meets Buzz, a boy who is completely obsessed with comic books. They soon have many adventures together and Sunny becomes interested in Buzz’s comics world. "But the question remains - why is Sunny down in Florida in the first place? The answer lies in a family secret that won’t be secret to Sunny much longer…"
"It's not your fault and not your job to fix him" This is something that Sunny's Grandpa says to her when she finally tells him what's been on her mind all summer. This is VERY important for kids to hear. Often when families are going through issues the children feel as though they are somehow to blame. This is true through all types of situations, not just substance abuse and I believe that is what the Holms were trying to get across through Sunny's story. I love the author's note at the end of the book stating why the Holms wrote the book in the first place. They say the story is autobiographical and they wrote it so that kids dealing with these kind of family issues would not have to feel alone. They felt that young kids shouldn't have to feel ashamed when they have family members with substance abuse problems. They also state in their note that it's OK for kids to feel scared and need help. They suggest reaching out to their parents, relatives, teachers, school counselors and other trusting adults for resources. Using humor, great 70's references, and the love of comics, Jennifer and Matthew Holm tell an important and masterful story while being accessible and appealing to kids. I would recommend this to those in the 4th grade and up.